← Ready for the Big House? 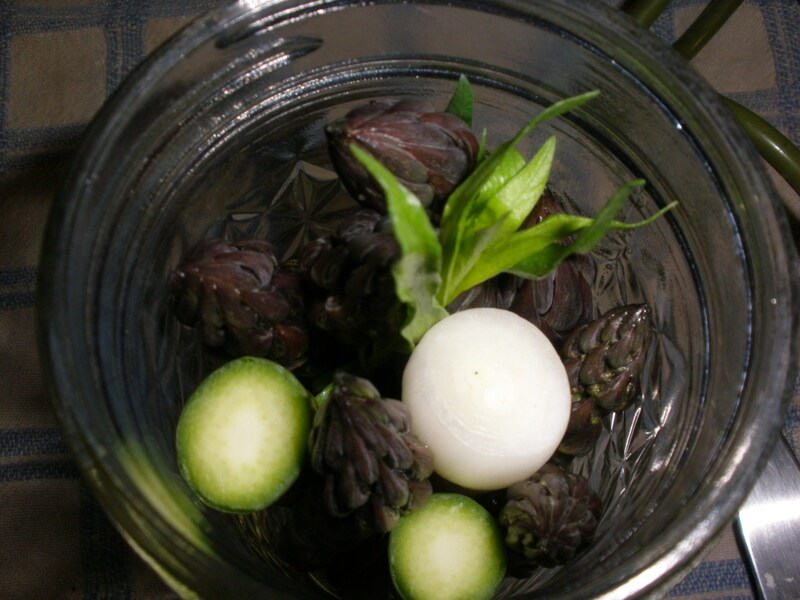 I have to admit that until now I’ve never actually eaten a pickled asparagus spear. I love pickled cauliflower, carrots and cucumbers. Pickled onions are yummy and “dilly” beans are delicious. Up ’til now, the occasion has just not presented itself. Don’t get me wrong, I love asparagus. I was sure that I would love pickled asparagus. I have looked at expensive little jars of pickled asparagus, but couldn’t bring myself to spend $6 for one little jar. So, when the Can Jam ingredients were announced, I knew what I was going to do. Asparagus spears prepped for their big day. Seasonings to be added to each jar. I did not blanch my asparagus first. I found recipes that called for it and recipes that didn’t. I contemplated it, but decided that asparagus turns brown enough when you cook it so it doesn’t need a minute of cooking in addition to the ten minutes in the boiling water bath. The only benefit I can see to blanching is that the spears are more pliable so that you could fit more spears into a jar. Place canning jars into canning pot, fill with water and set on stove to brings to a boil. If you haven’t already, wash asparagus and trim to fit the height of your jars. If you use the tougher bottom ends of the asparagus, you may need to peel them but the tender top bits shouldn’t need to be peeled. Combine vinegar, water, salt and sugar in a saucepan. When the water bath comes to a boil, bring the brine to a boil. Add peppercorns, allspice and mustard seeds to the bottom of the jar. 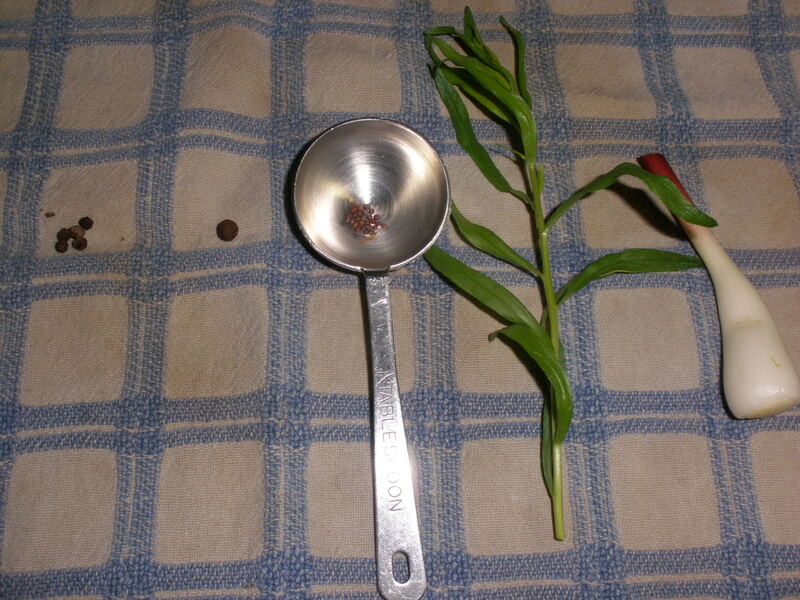 Fill the jar about halfway with spears (tips up), tuck a sprig of tarragon into the jar and finish packing. Once the jar seems full, shove the leek between the spears bulb-end up. This will help keep the spears from moving around. Jar packed and ready to be filled with brine. 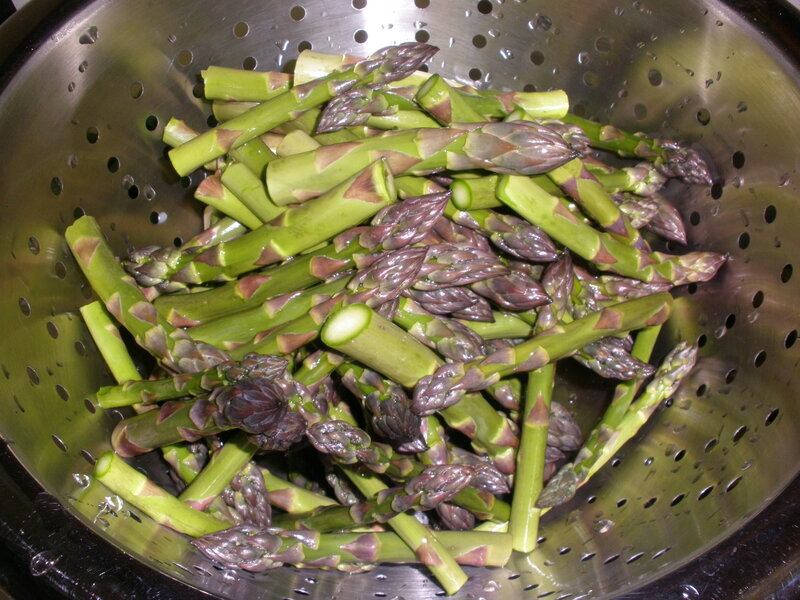 In the picture above you will notice some asparagus “bottoms” visible. Some of my spears were long enough to use both the bottom and the top of the spear so I peeled the bottoms of the longer spears and added them to the jars. Once the jar is full ladle hot brine into the jar leaving head space and seal the jar. Work quickly to pack the rest of your jars; by the time I finished packing the seventh jar, my first jars were already browning. Once the jars are full, return them to the boiling water bath and process for ten minutes. Yum! 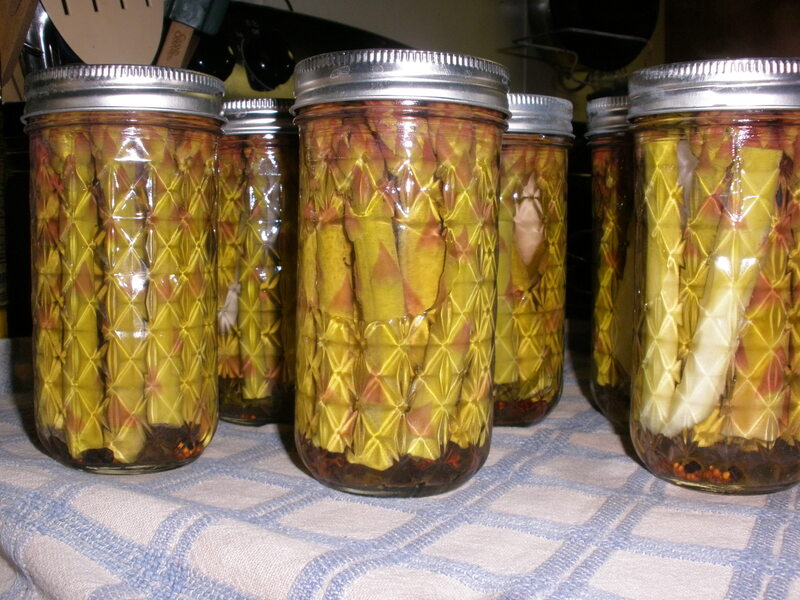 Love that picture of the jars and I bet they are yummy! Thanks for the recipe. This may be on my to-do list for this week. Yours look great! O pretty! I love that last picture!